This event is hosted by: Lil’ Blog and More, Southern Mom Loves, Your Strong Tower, and On Honeysuckle Hill.And the event is co-hosted by the following bloggers:Parenting Healthy, Easter Babe’s Theory, Aging Like a Fine Wine, Shabby Chic Boho, and Lake Hartwell Agent. This great group of bloggers have come together to bring one awesome giveaway prize, to one lucky winner! 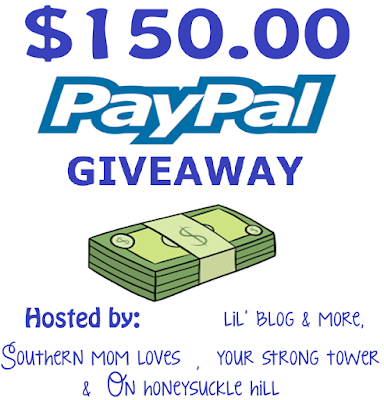 We are very happy to have a $150 Paypal prize, up for grabs!What will you use the money for if you win? Buy school supplies for your kids? A lot of pumpkin spice lattes? Personally, I’d love to buy a few things to freshen up my fall wardrobe! If I won I would buy some school clothes and shoes for my son and some groceries for the upcoming holiday dinners. If I won, I would pay a few of our bills (electric/water/etc.) and put some money towards debt.